^ The Register of the Kentucky State Historical Society, Volume 1. Kentucky State Historical Society. 1903: 34. ^ George Western Thompson; A Virginian. Biographical Sketch of Hon. Linn Boyd, of Kentucky The Present Speaker of the House of Representatives of the United States. Printed at the Congressional Globe Office. 1852. ^ John E. Kleber. The Kentucky Encyclopedia. University Press of Kentucky. 5 February 2015: 108. ISBN 978-0-8131-5901-0. 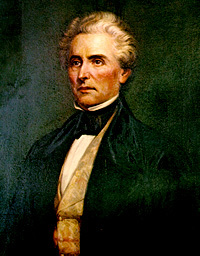 ^ John E.L. Robertson. Paducah Frontier to the Atomic Age. Arcadia Publishing. 7 May 2002: 39. ISBN 978-1-4396-3051-8. ^ Horace GREELEY (and CLEVELAND (John F.)); John Fitch CLEVELAND. A Political Text-Book for 1860: comprising a brief view of presidential nominations and elections, etc. 1860: 5. ^ Kentucky. General Assembly. Speeches and Proceedings Upon the Announcement of the Death of the Hon. Linn Boyd In the Senate and House of Representatives of Kentucky, Tuesday, December 20, 1859. Printed at the Yeoman Office, J.B. Major. 1860: 21. ^ Perrin, William Henry. Counties of Christian and Trigg, Kentucky : historical and biographical. F.A. Battey Publishing Company. 1884: art II, p. 29.